Incoterms or International Commercial Terms are a series of pre-defined commercial terms published by the International Chamber of Commerce (ICC) relating to International Commercial Law. They are used in International commercial transactions to clearly indicate the responsibilities of the buyer and seller of goods when shipping and insuring goods. It is easy to confuse this with ownership of the goods but incoterms do not actually define where titles transfer. 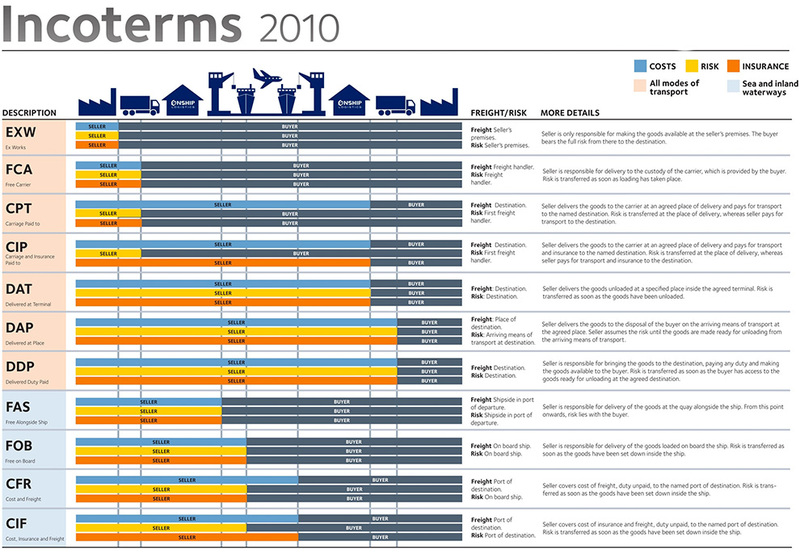 The Incoterms rules are accepted by governments, legal authorities and practitioners worldwide for the interpretation of most commonly used terms in international trade. They are intended to reduce or remove altogether any uncertainties arising from the interpretation of rules in different countries. As such they are regularly incorporated in to sales contracts worldwide. Seller is only responsible for making the goods available at the sellers premises. The buyer bears the full risk from there to the final destination. Seller is responsible for the delivery to the custody of the carrier which is provided by the buyer. Risk is transferred as soon as the loading has taken place. Seller delivers the goods to the carrier at an agreed place of delivery and pays for the transport to the named destination. Risk is transferred at the place of delivery, whereas seller pays for transport to the destination. Seller delivers the goods to the carrier at an agreed place of delivery and pays for transport and insurance to the named destination. Risk is transferred at the place of delivery, whereas seller pays for transport and insurance to destination. Seller delivers the goods unloaded at a specified place inside the agreed terminal. Risk is transferred as soon as the goods have been unloaded. Seller delivers the goods to the disposal of the buyer on the arriving means of transport at the agreed place. Seller assumes the risk until the goods are made ready for unloading from the arriving means of transport. Seller is responsible for bringing the goods to the destination, paying any duty and making the goods available to the buyer. Risk is transferred as soon as the buyer has access to the goods ready for unloading at the agreed destination. Seller is responsible for delivery of the goods at the quay alongside the ship. From this point onwards, risk lies with the buyer. Seller is responsible for delivery of the goods loaded on board the ship. Risk is transferred as soon as the goods have been set down inside the ship. Seller covers cost of freight, duty unpaid, to the named port of destination. Risk is transferred as soon as the goods have been set down inside the ship. Seller covers cost of Insurance and freight, duty unpaid, to the named port of destination. Risk is transferred as soon as the goods have been set down inside the ship.